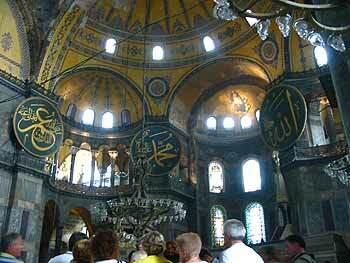 We opted to go first to the Aya Sofia Museum again - that is, to go inside rather than breeze past as we had last time. This was possibly the most expensive of the attractions so far at around �7 a ticket, but inside it really is quite an impressive view - if you excuse the scaffolding tower on one side that has been there for over two years as part of a restoration program on the domed roof. The museum was once a mosque, and before that it was a church. Because it's no longer used as a mosque, there is no need to remove shoes here, nor are there any dress code considerations. While it might be a museum, in 'official' terms, you can still feel the religious significance of the place. 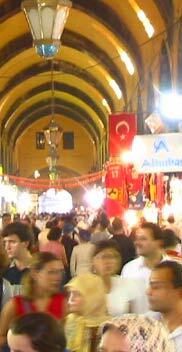 Another place we had wanted to look at was the Egyptian Spice Bazaar. Much like our last walk around Istanbul trying to find the Süleymaniye Mosque, this proved to be difficult to find. We discovered that to get to the bazaar involved heading down ever narrowing streets with ever increasing numbers of people. We were not even sure that we were heading in the right direction, as they all seemed to be locals - no sign of other tourists. Apparently Saturday is market day, and didn't we know it now! 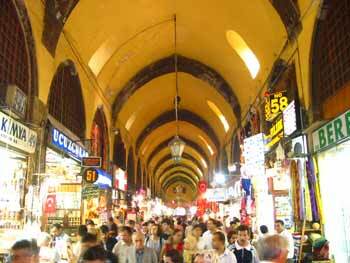 The Egyptian Spice Bazaar is much smaller than the Grand Bazaar, although it does sell more than just spices. It sells rather a fine selection of nuts too, and we ended up buying 2 kilograms of pistachios at one stall. The first - and only - purchase we made after all the effort getting there, which immediately filled up my rucksack. Manda saw a belt at one store similar to one she had bought in the UK. The shop owner asked her how much she had paid for her belt - she replied �2 when it had actually cost around �8. His face dropped at this - he couldn't believe that it was cheaper in the UK than the best price he could offer. He had no idea he was being wound up! Coming out from the front door of the bazaar, we found ourselves right outside another mosque - the Yeni mosque - and directly facing the Galata Bridge leading over to the Galata Tower in the distance. We had hoped to go up the tower, but the view today was too hazy, and so we decided not to bother going across the water. Normally, though, it would offer great views back over the oldest parts of Istanbul, a skyline full with soaring minarets. For our final night out, we went as a group back up to the Sultanhamet district. I can't recall the name of the restaurant, but the head waiter was quite memorable! 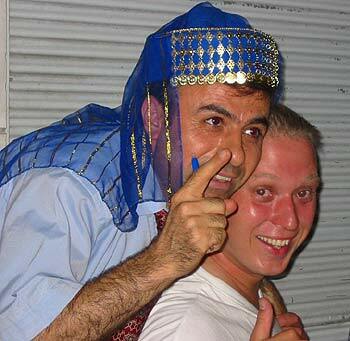 Neil had suggested that on the last night, fancy dress was optional. Manda and I had both bought silly hats for the evening, thinking that a few others would join in, but no-one else came prepared. So, Manda's hat/head-dress ended up being passed around the table for photos; the head waiter seemed to want to wear it more than anyone else. 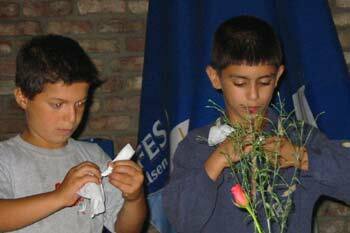 Throughout the meal, we had children come up to us, tapping on our arms to sell us roses. They had very few takers, given that this was the last night and many people were short on cash. They seemed really put out when one of the waiters demonstrated that roses could be made very easily - from a paper napkin. Enterprising as ever, the kids had a go at it themselves; I looked over and saw two of them, deep in concentration at another table trying to perfect the technique. They might well be on to something here!